On Friday 30 September, in the presence of H.M. King Carl XVI Gustaf of Sweden, the inauguration Ceremony of the plant. The equipment is in place now and production has commenced. 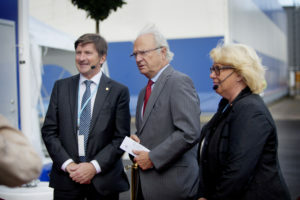 From the left: Lars Idermark, CEO of Södra, H.M. King Carl XVI Gustaf, Lena Ek, Chair of Södra. «The expansion is an important part of our strategy and a necessary move if we are to develop our operations. The paper pulp market is growing globally, and we will now have the opportunity to meet this demand and to continue growing together with our customers. We already deliver high-quality pulp to several different customer segments, which we will now be able to develop even further. This expansion will allow us to further strengthen our market-leading position and remain our customers’ preferred supplier,» said Lars Idermark, President and CEO of Södra. In addition to increased pulp production, the investment means that the plant will become even more energy-efficient, and Sӧdra estimate that electricity generation will reach ~800 GWh, compared with ~400 GWh before. 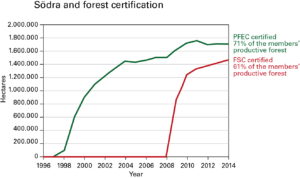 A rough estimate shows that Södra Cell Värö will consume ~600 kWh/Adt of electricity, and since the pulp production estimate is approximately 700 000 Adt/year, this will mean consumption of ~400 GWh which would provide an excess of ~400 GWh. Thanks to the investment, Södra’s deliveries of green energy will increase further, which will help replace society’s use of fossil fuels. Södra Cell Värö is already currently fossil fuel-free during normal operation. According to forecast estimates, the number of trucks carrying timber to and from Värö will increase by 46 percent, from approximately 270 to around 500 per day. Some raw materials will also be transported by train and ship, and this proportion will increase. 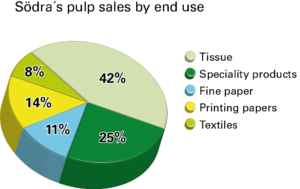 In order to be able to assess the environmental impact of transportation, the load has been calculated in terms of the local area for all transportation in and out of the plant, with and without goods. Carbon dioxide emissions will increase as the mill has expanded and will be transporting greater volumes of product, but Södra stipulates tough environmental standards from all contractors. In addition, the increase in electricity and biofuel deliveries will compensate for this increase. All transportation managed by Södra currently runs on HVO, which is a biofuel. An analysis is currently under way into the use of longer and heavier vehicles, weighing 74 tonnes, which would compensate for the increase in the number of vehicles to and from the mill. Machine Equipment was supplied by Valmet, a new fiber line, new digesting plant, remodeling and additions to pulp mill, rebuilding and completing the drying machine and baling lines, reconstruction and completion evaporation, reconstruction and completion recovery boiler, reconstruction and completion causticisation. Doosan Skoda for the new condensing turbine. Raumaster for the chip stock, chip conveyors, screening station. GEA foe the cooling tower. Purac for water treatment chemical precipitation. Goodtech for the total desalination plant. Velolia Water for the biological wastewater treatment plant. Akzo Nobel for the dioxide plant. All construction excluding chlorine dioxide plant was supplied by NCC and by Peab for the chlorine dioxide plant. Electricity and Automation: ABB for the Control Systems, and Drives. Vattenfall for Medium and high voltage. Vacon for AC drives. Switchgear for the Switchgear. Sweco for construction and projection pipes. Pulp+ is a completely new service concept. Södra’s customer offering, Pulp Services, was ahead of its time in offering enhanced services for customers on everything from market statistics to environmental data and tracking information. But now that service is rising to a new level with an invitation for customers to create a truly bespoke partnership with Södra to add value for the future. Pulp+ is Södra’s way of turning the cone upside down; instead of offering standardized services, it will analyze customers’ real needs and provide tailor-made solutions. Pulp+ is divided into four areas –Innovation, Products, Facts and Support – and each can be tailored to individual needs. Innovation is about challenging customers to grow, be it through incremental improvements or cutting-edge new product development. In addition to a focus on innovation for the future, Pulp+ Products is the starting point to help customers find the right pulp for their needs today, either from the product portfolio which contains more than 50 variants, or with a specially-tailored quality with a range of logistical options. 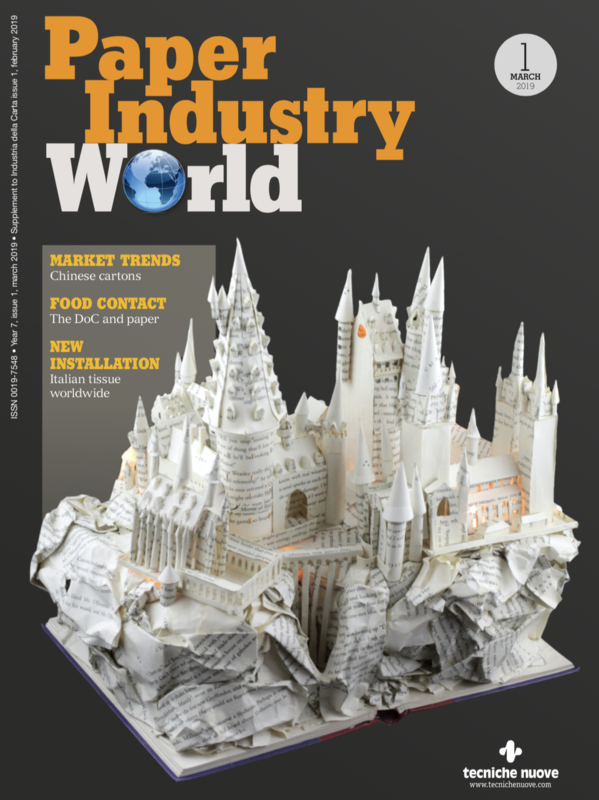 Pulp+ Facts, meanwhile, will offer customers a wealth of information to support their pulp choices, from technical data sheets and quality data functions, to information on planned deliveries, sustainability market forecasts and more. Pulp+ Support is just that – help in whatever form the customer needs it, whether it be remote or on site. Södra prides itself in having one of the most comprehensive product portfolios in the pulp industry, offering customers more than 30 variants to choose from. The newly-expanded Värö mill will see the addition of more green, black and flash-dried grades of the highest quality. Between autumn 2015 and spring 2016, around 800 contractors clocked in each weekday. During the major shutdown in May-June 2016 up to 2,840 additional people were clocked in, on top of Värö’s usual workforce (just over 300 employees). 400 portable cabins for changing rooms, break rooms and offices were installed. Tents with canteens for 500 people, and changing rooms for 1,025 people. Scaffolding material totaled 230,000 m³, or 230 km in 1-m³ packages, i.e. the distance between Gothenburg and Malmö, or 340 fully loaded trucks (14-metre), equal to a 5-kilometre stretch of trucks if they were lined up. The entire project required 30,000 m³ of concrete and 3,000 tonnes of reinforcement. New pipe racks: Total length 970 m. Work was also performed using old pipe racks, with a total length of 540 m. In total, piping measured around 9,950 m, and about 12,000 m when the various departments are included. In the recovery boiler, about 3,000 joints have been welded. Not one of them leaked under pressure. «We are delighted to announce that production is under way. Our focus in the immediate future will be on ramping up the production rate» said Gunilla Saltin, Business Area President of Södra Cell. 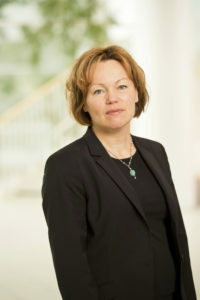 Gunilla Saltin, Business Area President Of Södra Cell.